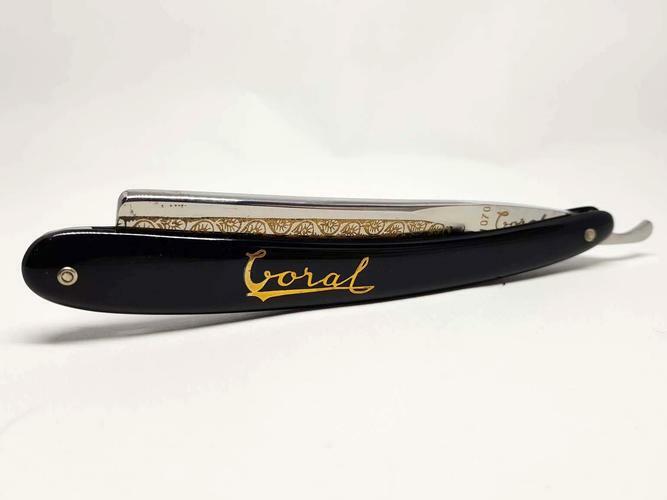 Coral 13/16" Japanese Straight Razor - 'For Barbers Use' - Excellent Condition! 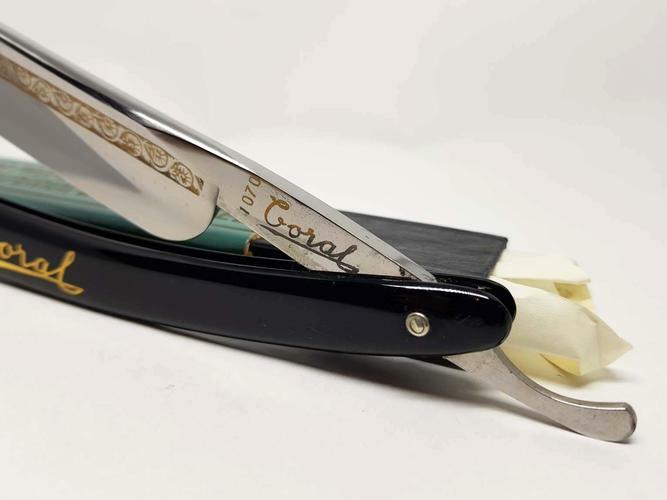 Thread: Coral 13/16" Japanese Straight Razor - 'For Barbers Use' - Excellent Condition! 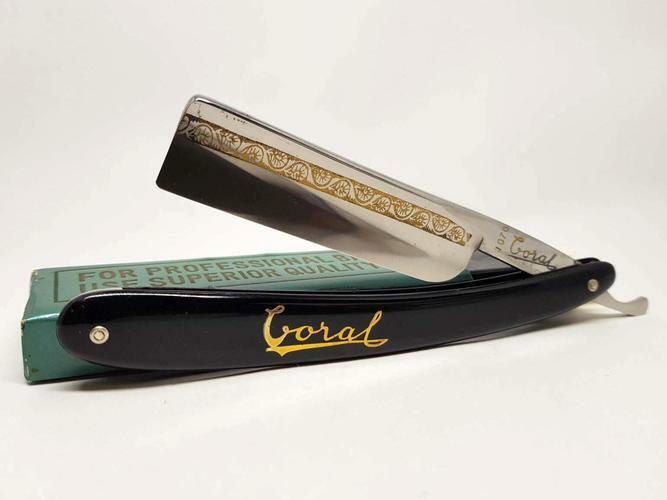 For sale is this beautiful ‘Coral 1070’ razor, made in Japan of Swedish steel. 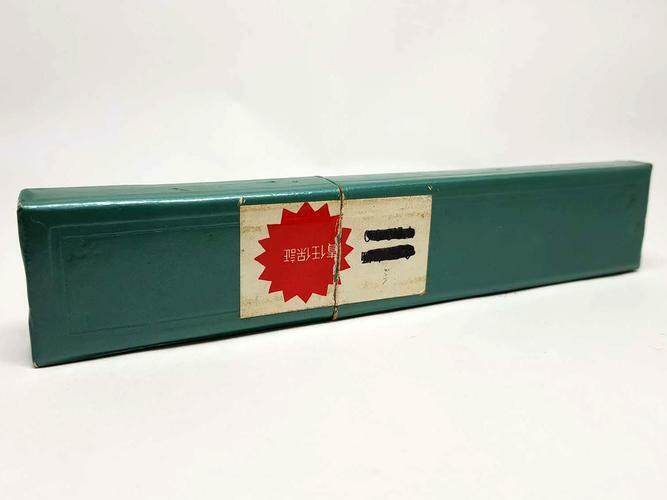 The heavy 13/16” inch wide blade is in excellent condition (some oil may be visible in the photographs) with a thick hollow grind and a square nose. It has an etch in the blade face that is back-filled with gold. The gold in the etch and tang stamp is tarnished in places but in excellent overall condition. 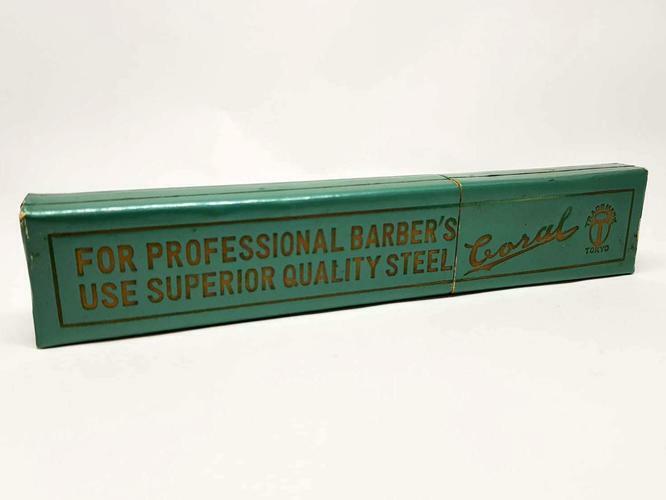 Stamped ‘For Professional Barber’s Use’ on the reverse side of the tang. 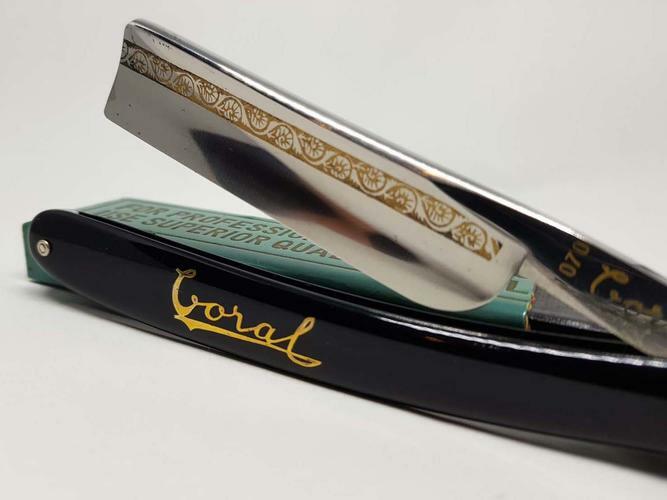 The original black plastic scales are sound and tight and have an inlaid ‘Coral’ logo. 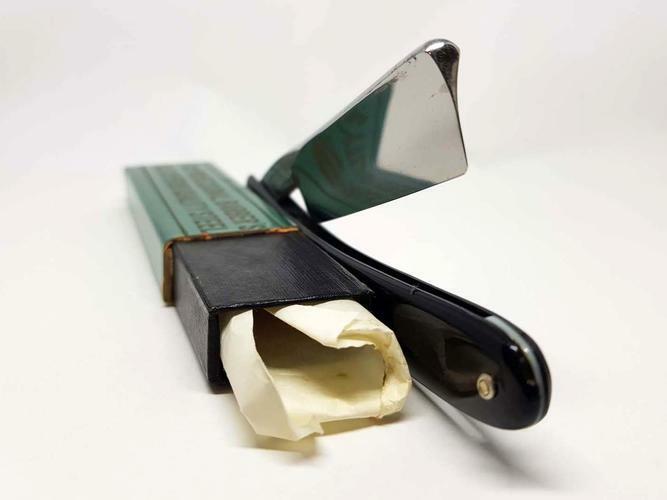 The razor comes with its original cardboard coffin case and waxed paper wrap. A rare full set. 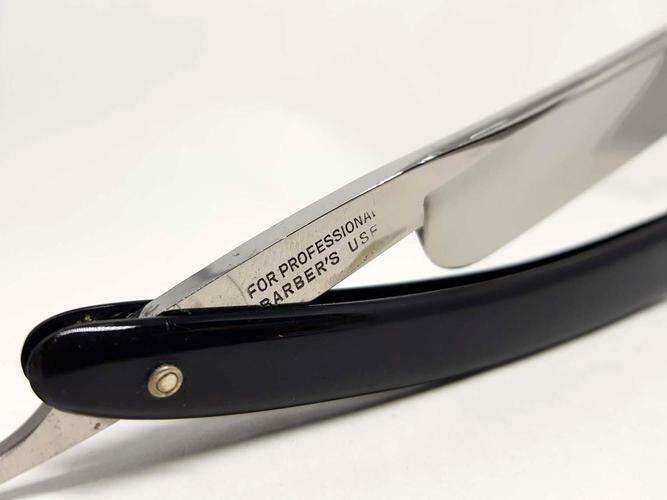 The edge is sharp and has been professionally sharpened in the past. 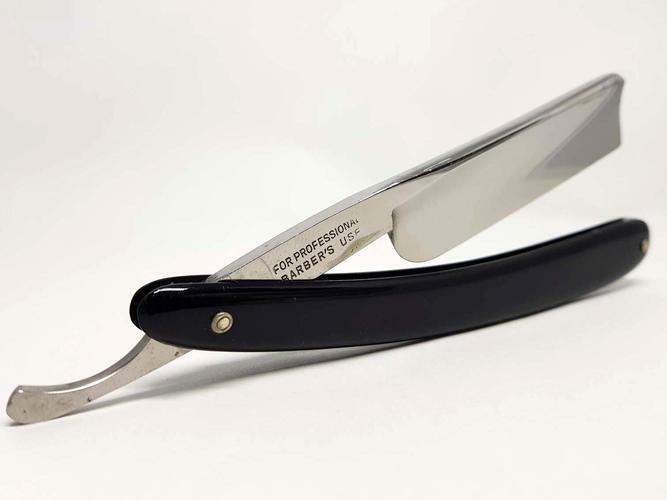 I have shaved with this razor (cleaned and sterilized after use) but your experience may differ as everyone’s beard shaves differently. I do not guarantee you a comfortable shave. Asking price is $120.00 USD which INCLUDES standard international shipping from New Zealand (where I am located). Standard shipping is not tracked and takes 7-21 working days on average to the USA (for example). Tracked postage is available when using international courier post, but this is an additional $20.00 USD (dearer in reality but I will subsidize the cost if the buyer requires tracking). If you are also in New Zealand please contact me for local rates. ScoutHikerDad, Geezer, Speedster and 5 others like this. Let's get this beauty back in someones rotation - price drop to $105 posted worldwide! That is a pretty piece.. And i am surprised it has not sold.. Someone please take this!!! Ive been back 4-5 times hoping to see it sold..
EisenFaust and germanstraightrazor like this. EisenFaust, Steve56 and lightcs1776 like this. Sold! Thanks SRP and buyer. Cheers!